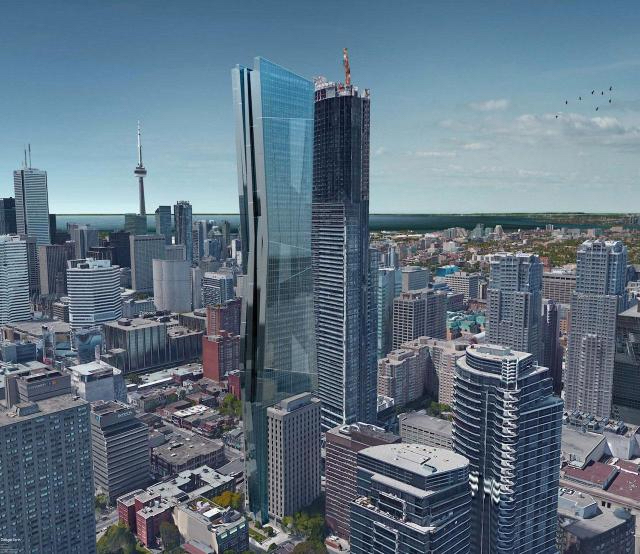 A rezoning application has been submitted to the City of Toronto for 415 Yonge St. proposing a 42-storey residential addition above the existing 19-storey office building, Urbantoronto.ca reports. The site includes 409 through to 415 Yonge St,, as well as 9 and 17 McGill St..
Winnipeg-based Marwest Group of Companies owns the site and designs have been prepared by Kirkor Architects & Planners, the website reports. If approved, the addition would rise to a final height of 239.35 metres, increasing residential density along the Yonge subway line. The architects have designed the addition from the 20th floor to a final height of 61 storeys, with a “pinch” design around mid height. “To create visual interest, translucent bands across the north and south massing cut through the glass facade and an angular vertical design is seen rising up the east elevation,” Urbantoronto reports. Two interstitial floors between the existing tower and addition would be included for structural and mechanical support.